For over a century, Einstein’s theory of relativity theory has been one of the foundational cornerstones of modern physics. As discussed in Tutorial twelve, relativity theory’s equations often provide good answers because they are approximations for the Modern Mechanics equations. Because relativity theory is no longer the best predictor of experimental results, we must now show exactly where relativity theory fails. Fortunately, we can readily show where Einstein makes a not–so–obvious critical mistake that invalidates his entire theory. The principle of the constancy of the velocity of light, which says that the ray of light (eg, the oscillating system) always moves at velocity c with respect to the stationary system. Postulates are simply assumptions that must be true. These postulates, which are related through Einstein’s mathematical equations, form relativity theory. In fact, terms like time dilation and length contraction, which we will discuss in a later tutorial, are a byproduct of this relationship. Einstein recognized the importance of demonstrating that these postulates are compatible with each other. To show this is the case he developed the spherical wave proof. There’s only one problem with his proof: contrary to Einstein’s conclusion, the proof actually fails. 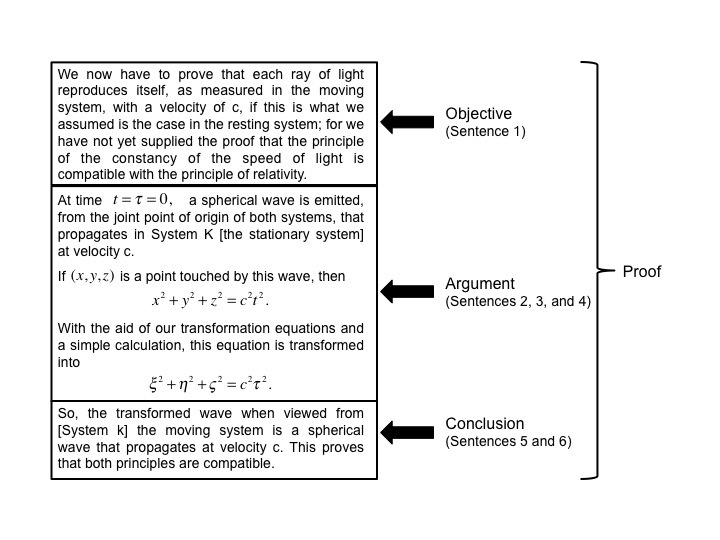 Before we begin to look at Einstein’s proof, we need to examine how a math statement might be perceived to pass, but actual fail. This is not as uncommon as it sounds. 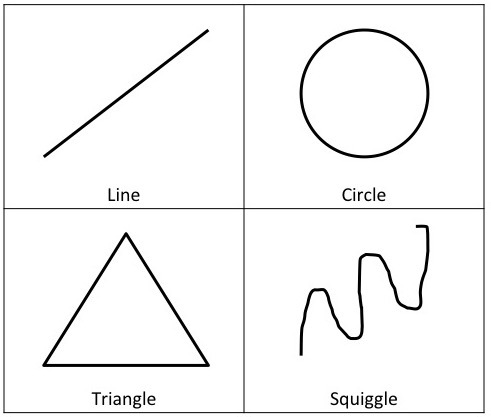 So, it might surprise you to learn that each of the shapes in Figure 1 can be described using this equation! If we only use Equation 1 on the points without checking the radius, we would incorrectly conclude that these points are all on the same circle. It should be obvious that they are not on the same circle, and the reason is because they do not share the same radius. In other words, if we use Equation 1 without confirming that the radius is unchanged, we can reach the wrong conclusion. This is the mistake Einstein makes in analyzing the spherical wave proof. The proof is straightforward and consists of six sentences in §3 of his 1905 paper. Einstein believes that he has arrived at the equation for a sphere, which leads him to incorrectly conclude that his proof passes. 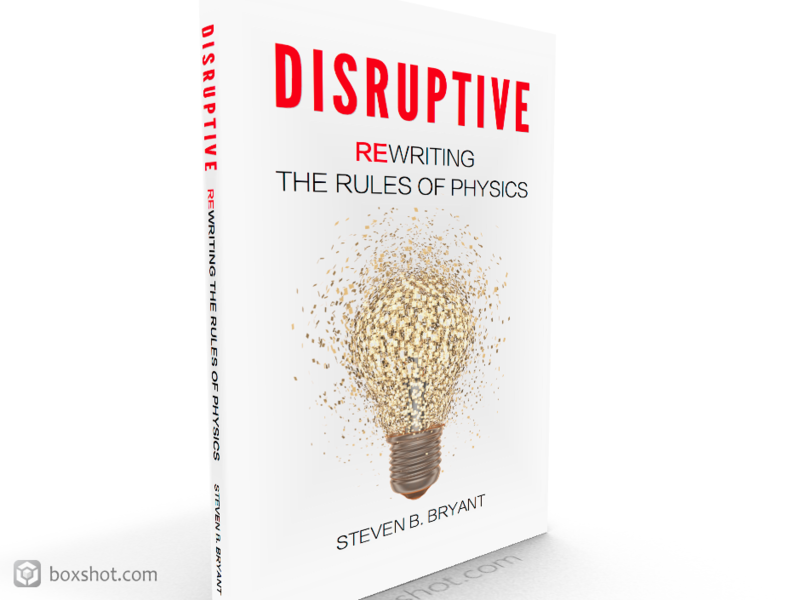 This is an extremely important point: If you perform the same steps as Einstein, you will also begin with a spherical wave and conclude that the transformed shape is a spherical wave. In other words, you will conclude that the proof passes. In actuality, the proof fails, which can only be determined by realizing that proof is incomplete. The complete proof requires that the transformed shape have a constant radius. However, as illustrated below, the transformed radius, which he defines as cτ, is not constant for every transformed point. In addition, this distance is not measured from the center of the shape! 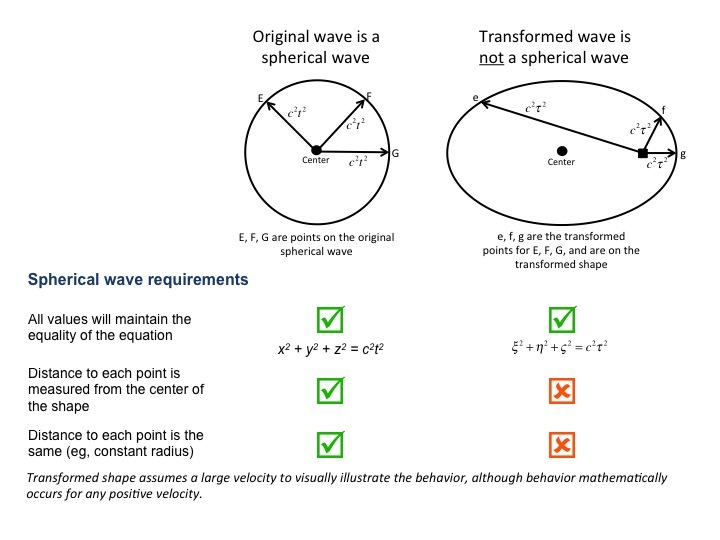 Because the “radius” for the transformed shape is not constant and is no longer measured from the shape’s center, it cannot be called a spherical wave. The proof fails. As discussed in Chapter 1 of DISRUPTIVE, it is only when you check for an unchanged radius that you will determine that the radius is not constant and that it does not originate at the shape’s center. In other words, it is only when you properly complete the proof that you can determine that a spherical wave was not formed. This failure means that Einstein was not successful in associating his two postulates. This failure invalidates relativity theory and means that concepts like time dilation and length contraction – which are unique to relativity theory – no longer apply. A benefit of this analysis is that it cannot be challenged using one of Einstien’s concepts, such as time dilation or length contraction, because their use would represent a priori knowledge. Simply said, those terms cannot be used until after the successful completion of the proof. In tutorials twelve and thirteen, we have answered a very important question: If Einstein’s theory is wrong, why do people believe that it is theoretically and mathematically sound? Scientists believe relativity theory is sound because the steps he performs in his proof are valid, but they have not realized that those steps are incomplete. In addition, scientists believe that relativity theory is mathematically proven because it gives good results, but they have not realized that those answers are approximations for the more accurate Modern Mechanics equations. It it only when you recognize that the spherical wave proof is incomplete and his relativity theory equations are approximations that you can appreciate and understand what is occurring. Relativity is simply an invalid theory that often provides good approximations. ⟵Tutorial Twelve – Approximation: The REAL reason relativity appears to work!